It sounded so innocent and so great when Tony first proposed this ride. We were in Arizona at the time, missing our bike buddies. I admit that it’s possible I read only what I wanted to read… Blahblah..fattire…blahblahblah…century…blah..gravelroad…blahblah..customjerseys!!…blah..camping. Well, of course, I’m in! Perhaps some of the finer details escaped me. As the time grew closer, it was apparent to me that my somewhat fragile hands would never survive the pounding of a 100-mile gravel road ride, so I offered the Crankshaw SAG service for the ride – road snacks, mechanical assistance if required, transport off the route if requested, and a big camp breakfast the morning after. 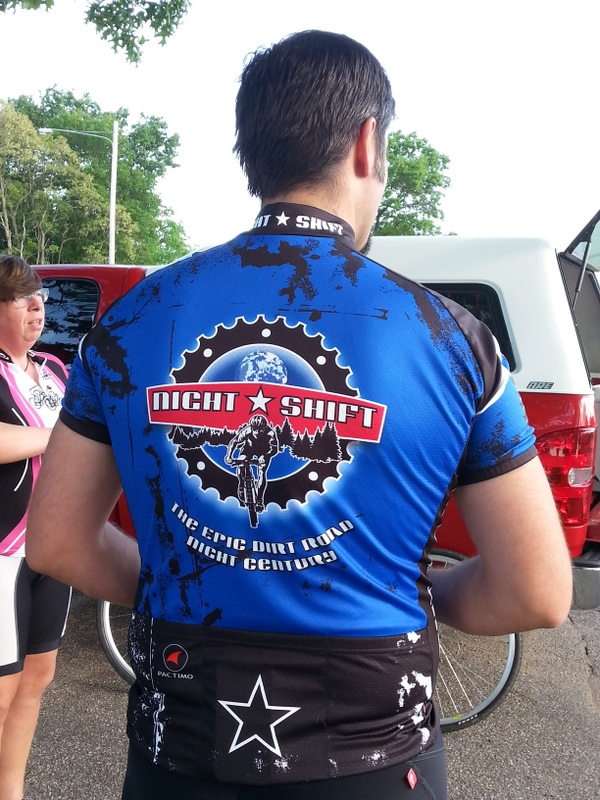 Chief Night Shifter Tony jumped on the offer, and plans were made…. 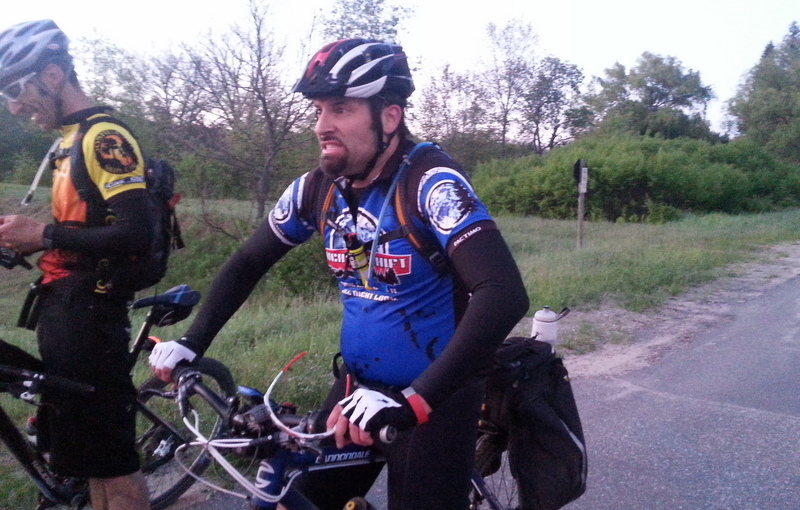 Ride finish: Silver Creek Campground, near Luther, MI. 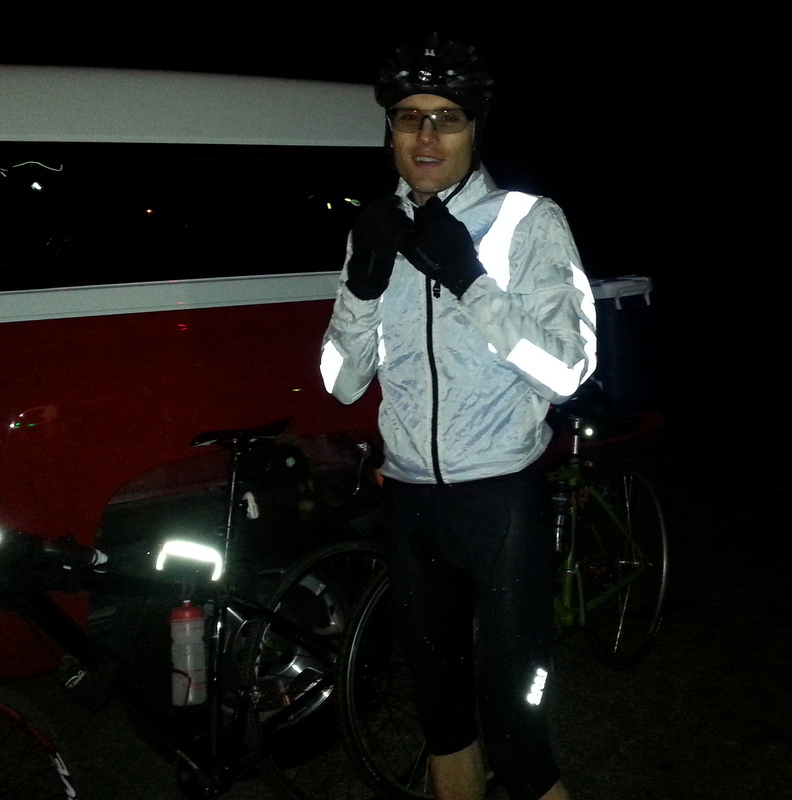 Tony figured that it would take most of 10 hours to complete the night-time ride. Slower speeds in uncertain terrain (including a section of singletrack) at night do not make for speedy riding. In high spirits, our eight riders rolled away: Tony, Matt, Matt, Matt, Susanne, Bob, Joel, and Jason. First detour of the evening? Thru the cemetery across from the church..as Bob quipped, “Better to start there, than to finish there”. Eight riders disappeared into the sinking light of the evening. Since the early riding would be fairly flat, with daylight available for much of the time, we decided to make our first SAG stop with the gang around the 47 mile mark, around 11:30. We barely got there ahead of the riders – we could see them in the distance, riding close enough to share headlights – like a big bubble of light filled with bikes. 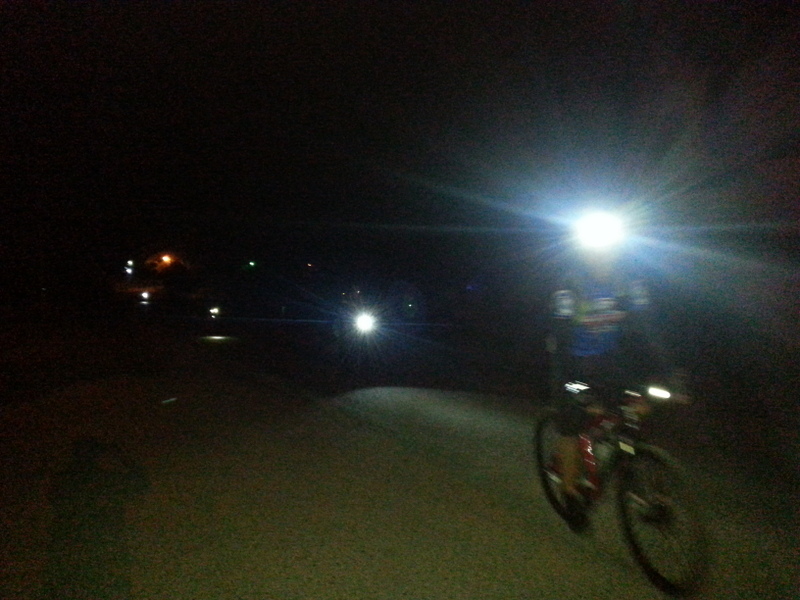 Everyone had quality lighting for their bikes, and reflective clothing also helped to catch headlights. High spirits abounded. A few snacks, Subway, water bottles refilled, and clothing adjusted for cooler temps. Lights? Check! Gloves? Check! Jackets and arm warmers? Check! 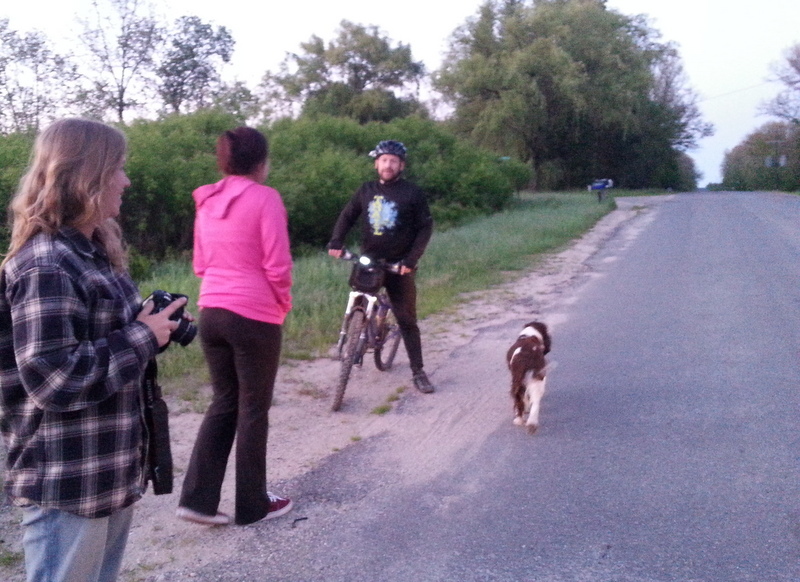 Since just a bit over four hours had elapsed since the ride start, there was lots of upbeat chatter about actually finishing the ride by 5am. (yeah, right…) Off they rolled into the darkness. 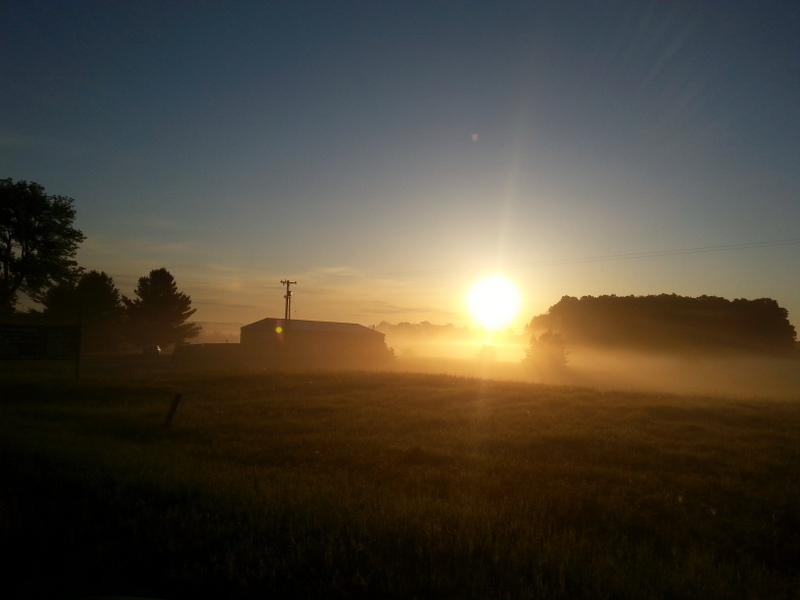 In Newaygo County, there is plenty of dark, and very little cell phone service. The other SAG with Dawn, Lindsay, and Super Springer Emma rolled away, while we hung out for a bit, waiting for our 3rd SAG Brad to arrive. Several broken-up phone calls later, we finally left without him, leaving a rough map stuck to the bench for him to find. 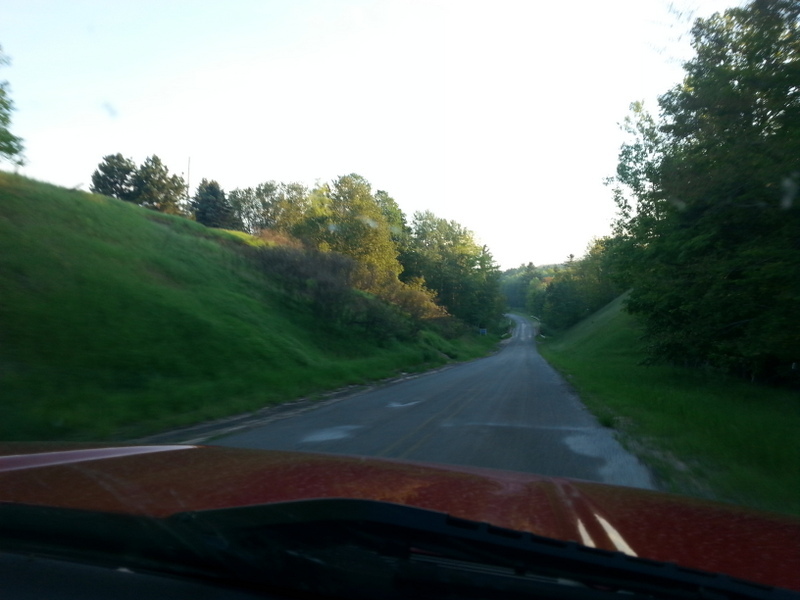 We headed off to the Woodville Country Store, pretty much out in the middle of nowhere, but on a paved road intersecting two sections of gravel road on the route. So, we waited…..and waited for headlights. Dawn and Lindsay have arrived, after unintentionally touring through White Cloud. Finally, eight bouncing headlights in the distance! Everyone’s a bit less jovial now, and all are freezing. It’s around 2:30 am, and it’s very cold and damp, especially in the low spots. The 50’s temperatures forecast are just a memory, and temps are down to the low-to-mid 40s. Hands are cold, and some teeth (particularly Joel’s) are chattering. A few jump into the truck to thaw for a few minutes. Most just stumble around for a bit, girding up for the next section, thought to be the toughest because of the four miles of singletrack (NOT a gravel road, just a path in the woods). Susanne and Joel are talking about routing around this section, and catching the group on the far side, so plans are laid. The sandy sections have caused everyone trouble – Susanne’s comment “There’s hard beige, and soft beige, and you can’t tell the difference until you fall over” seems to be accepted trail wisdom. Bob seems to have hit the ground waaay more than anyone else, but is still smiling (or is that a grimace?). There have been several un-ridable sections, where everyone has to pick up their bike & carry it. Cyclocross, as we call it. Joel, with his recently broken foot, has suffered more than his share with this maneuver. Everyone is now wearing all the clothes they’ve brought along. No one has full-fingered gloves – freezing fingers are the biggest complaint. In solidarity with our gang, John and I have not had the heat on in the truck. We’re wearing shorts, t-shirts, and hoodies and freezing our butts off too! (I know, I know…big deal) There’s general agreement that the trail isn’t going to get any easier if they stand around, so everyone gamely saddles up and rides off. Our plan is to meetup one more time, at about the 80 mile mark. Much of the last section after that was paved, and there would be some early morning light, so we figured everyone could roll into camp without further need for our intervention. We find an open gas station (4am!) in Baldwin, and try to re-caffeinate. We’re at our meetup spot, Dawn and Lindsay are there, and the first call for assistance comes in. Susanne and Joel took the detour, and have been waiting (forever!) for the rest of the gang to emerge from the woods. Have we heard from them? No. Do they want to be extracted from the route? Hmmmmm, not yet, they’ll wait a bit. But, standing around is killing them. Cold & miserable. We scour the map and determine where they are – they decide to slowly move ahead on the route and hope the others catch up (Stay with me now, it gets confusing)….Who shows up but Brad in the Disco SAG! (van outfitted with disco ball and blue LED party lights) After taking major detours around nowhere mid-Michigan, he’s rescue-ready, and goes off in search of Joel and Susanne. Comes back empty handed. Another map consultation, and he heads off again. Another hour passes and he finally comes back with two weary, cold passengers. FINALLY! 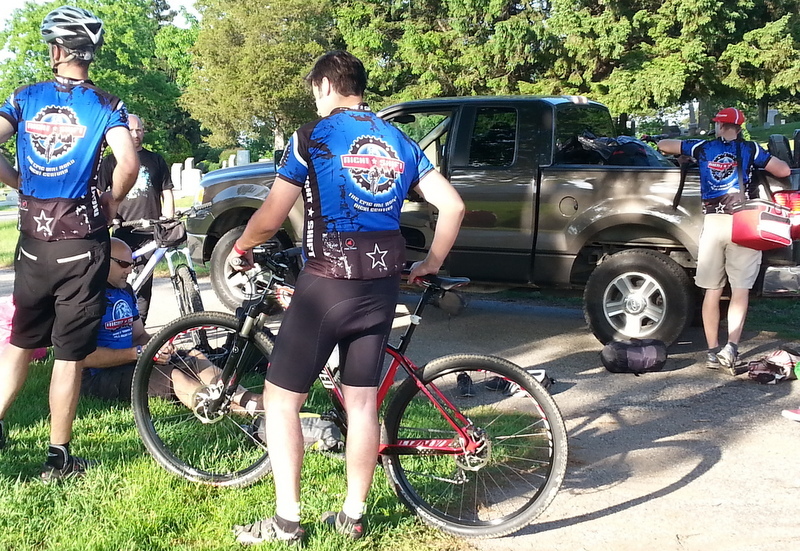 Six riders straggle over the hill to the rest stop. 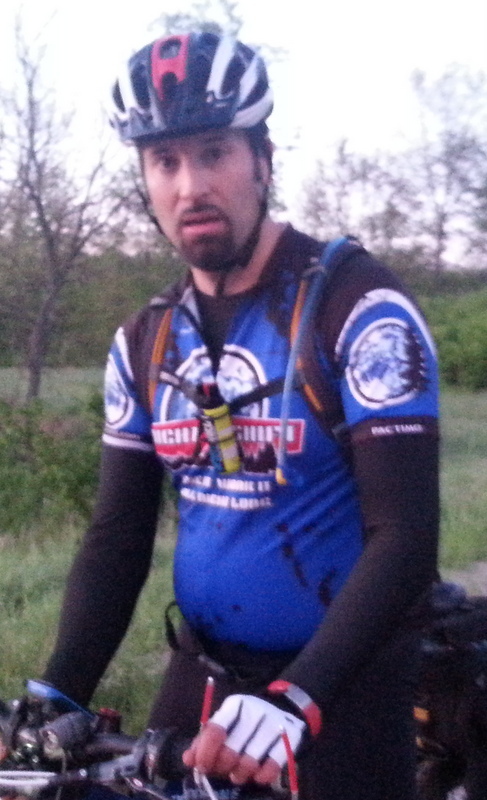 Tony rallies for the last 20 miles. Dawn and Emma still checking the horizon for Bob. The first light of day is now breaking up the darkness. Everyone is tired – most are grimly determined to push on to the finish. The last of the Subways are consumed, a few jump in the truck to warm frozen body parts. Bob has demolished the rear derailleur on his bike and converted it to singlespeed to get this far. He’s got this huge dirty splotch in the middle of the back of his jersey. Whaa? How? Quit? NO! 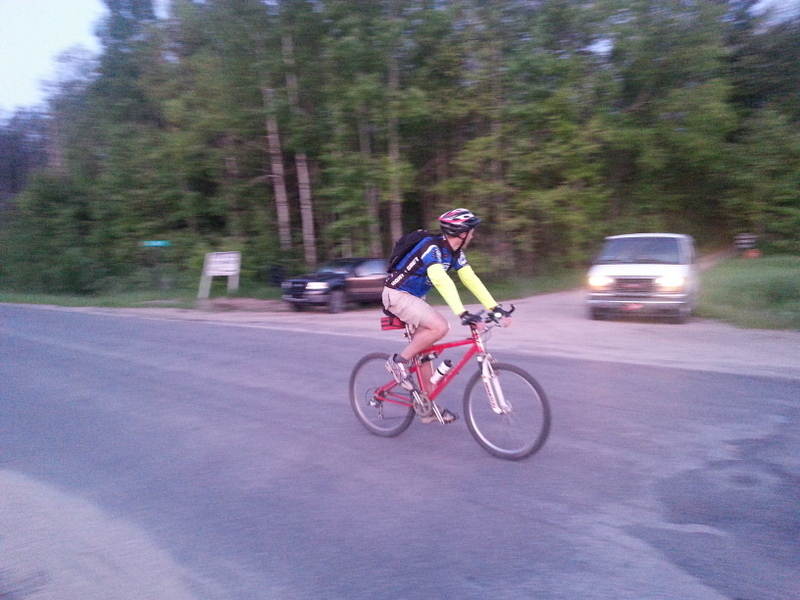 He grabs Dawn’s bike from their truck, adjusts the saddle height prepares to roll. Dawn’s grinning because she’s sensing a bit of justice here…..early complaints about the condition of her mountain bike have fallen on Bob’s deaf ears. Now he’s got to “shift twice up to go up one gear” or something like that. The wheels barely move. Oh well. Disco Van to the rescue! 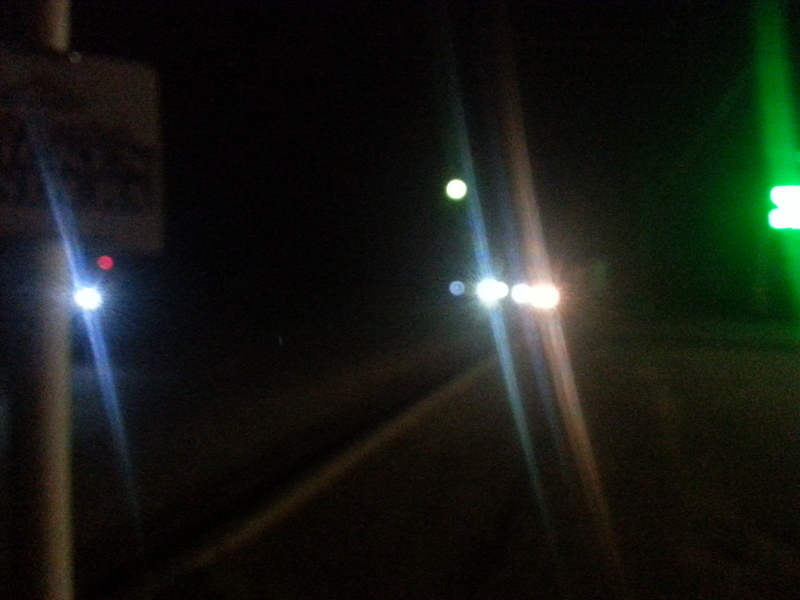 Twenty minutes later, with no more need for headlights to see the way, seven riders roll off. Susanne has decided to punch out of the Night Shift. Joel has wrenched himself out of the warm van and gotten back on the bike, with the help of a couple of shots of liquid courage (aka Captain Morgan). They guys head for the dirt – we hit the pavement, followed by Brad & Susanne and head for camp. We had made the trip to Silver Creek Campground early this morning, dropped the Fireball and set up Susanne’s tent for her. A most welcome sight. Last downhill – you can coast all the way into camp from here. We can’t wait to crawl into bed for a bit to warm up. 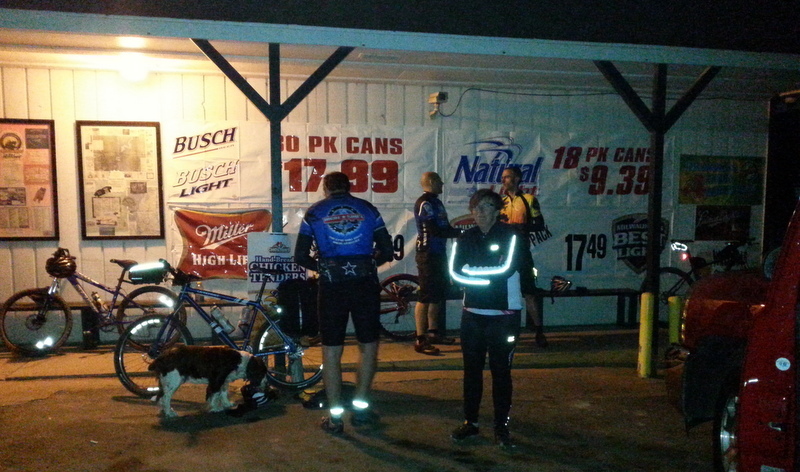 We finally arrive around 6:30 or so….riders get there at 8:05. So happy that we dropped off the Fireball early in the day. Night Shift camp life? To be continued….. 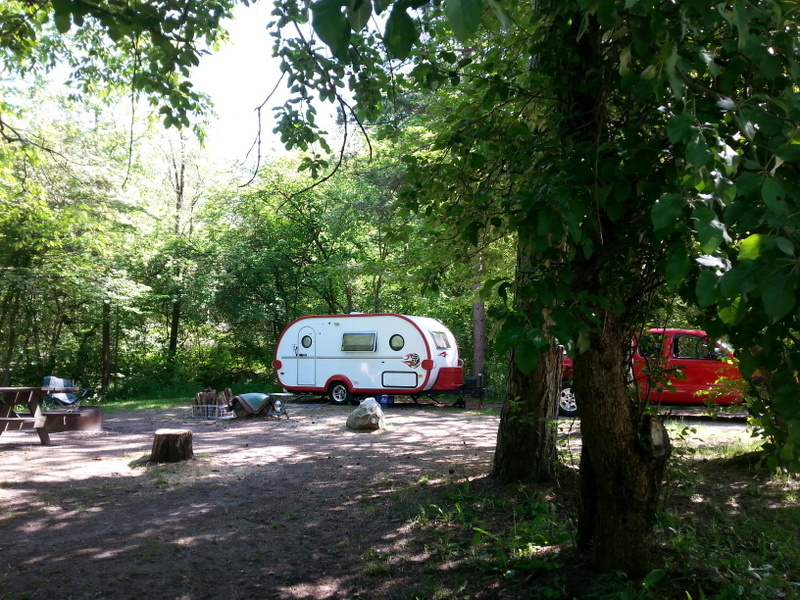 This entry was posted in cycling, great outdoors, Michigan, retirement, simple camping, T@DA and tagged camping, cycling, Michigan, the great outdoors by Judy Crankshaw. Bookmark the permalink. Wow, Judy. That turned into much more adventure than I expected. I was holding my breath while reading about it! Can’t wait to read that everyone’s warm and happy and glad they did it! After this, the National 24 Hour Challenge should be a breeze. Tell everyone, if they aren’t riding, to come visit. We love company. At least John and I got some practice for staying up for days on end…..